or mirror-reverse signature. ITAME HADA. GUNOME-NOTARE O-MIDARE. HIDARE KANEYASU(1) KEI-CHO: Originally frpom YAMATO. SUE-TEGAII line. Transferred to OSAKA in the KEI-CHO. SUNAGASHI through SUGU MIDARE BA. student of NANKI SHIGEKUNI. MASAME HADA. Billowing NOTARE and O-MIDARE BA. KANEYASU(3) EN-PO (t: KANEYASU 2): DANKU-DAYU. From KAN-BUN 1661. First signed KANESHIGE and transferred from TAMBA and became adopted into the forge. He did not sign with the invert MEI. Later transferred to MATSUMOTO in SHINANO. then changing to an invert MEI Large, strongly defined MEI as goes the school. 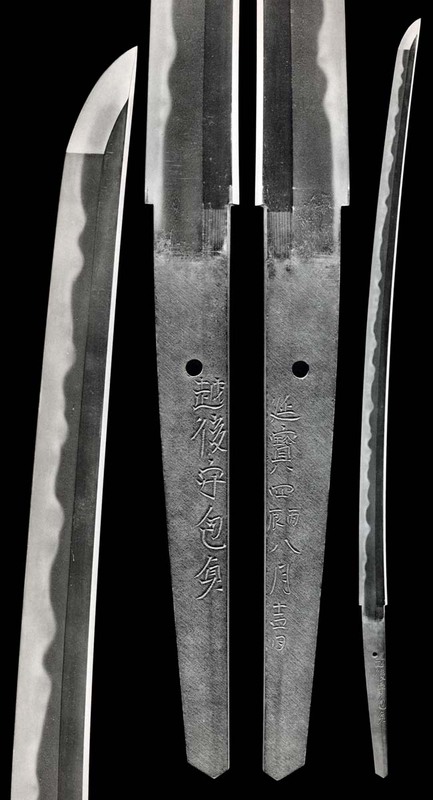 swords in YAMASHIRO. SUGUHA and GUNOME-MIDARE BA. WAZAMONO. with ASHI, and TORAN-MIDARE with TOBI. MARU-BOSHI. OSAKA YAKIDASHI. KANEMICHI KAN-EI (t: KANEYASU): Originally from YAMATO, transferring to OSAKA. GUNOME-MIDARE BA and NOTARE MIDARE BA. KANESADA(1) MAN-JI (t: IGAnoKAMI KANEMICHI): Originally from YAMATO. MIDARE and CHOJI-MIDARE BA patterns swing on uneven ASAKI-NOTARE waves. TORAN BA. Very well made swords. Shinogi-Tsukuri, Ihori-Mune, enenly curved with Chu-Kissaki. Toran Ba style Gunome-Midare Ba in clear and deep Nioi-Fukashi and Ko-Nie and having deeply falling Ashi-iri. Sunagashi finds to Mid. Ubu Kengyo Nakago has one Mekugi-ana. Signature in stronger strokes. Shinogi-Tsukuri, Ihori-Mune, shallow Sori, O-Kissaki. Exceedingly tight and well made Ko-Itame Hada that runs. There is brilliant Ji-Nie. Toran Ba with grouped O-Gunome forming Hako, box-like rises. There are Tama Jewels and Tobi. Ashi falls within and Sunagashi becomes pronounced in the mid. Chu-Sugu Saagari Boshi has a Togari-like Ko-Maru. Ubu Kengyo Nakago has one Mekugi-ana. Stronger strokes for the Mei. A KANEYASU student, NI-DAI ECHIGOnoKAMI KANESADA makes the famous NASHIJI-like, luminescent OSAKA steel to provide for this powerful SURIAGE NAGINATA. Deep NIE and SUNAGASHI appear on a rolling TORAN NOTARE BA HAMON pattern, for which the era and school are renowned. This piece displays the typical OSAKA YAKIDASHI of widening SUGU with a gentle NOTARE to mark. Shinogi-Tsukuri, Ihori-Mune, shallow Sori, strong Chu-Kissaki. Tightly knit and defined Itame Hada that runs. There is thick Ji-Nie. Toran Ba and Mimigata Ears form from grouped Gunome with Tobi-yaki in Nioi-Fukashi and clear, bright Ko-Nie. Sunagashi and Kinsuji attend. Osaka Yakidashi to the Moto. Full, Fukashi Boshi to ko-Maru Kaeri. 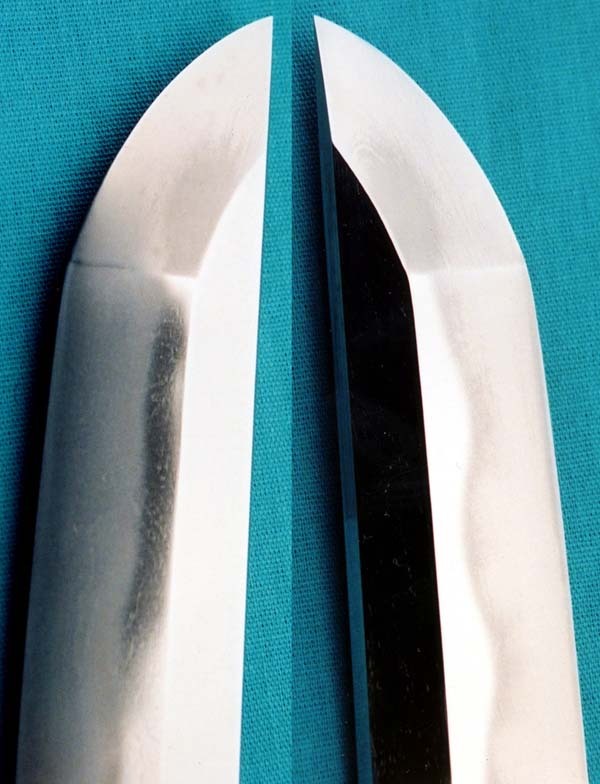 Shinogi-Tsukuri, Ihori-Mune, shallow Sori to elongated Chu-Kissaki. Tight Ko-Itame Hada with thin Ji-Nie. 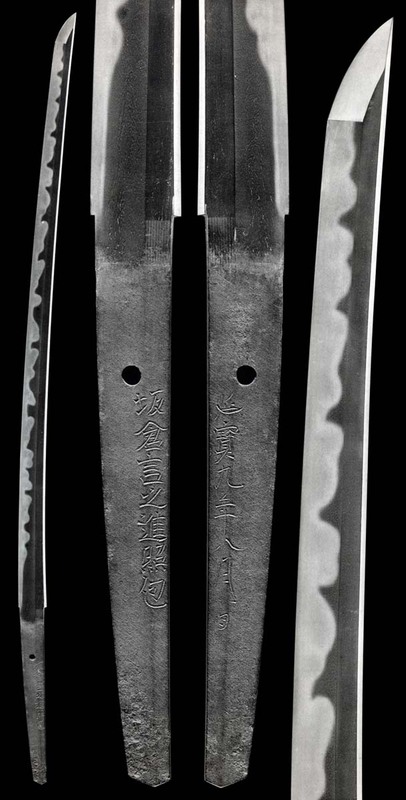 Toran Ba with grouped and leaning O-Gunome in deep Nioi-Fukashi and Ko-Nie. Ashi-iri falls while Sunagashi brushes figures. Ubu Kengyo Nakago has two Mekugi-ana. 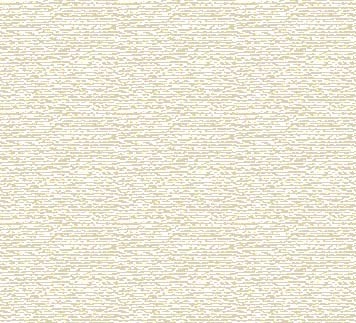 Signature in bolder strokes. 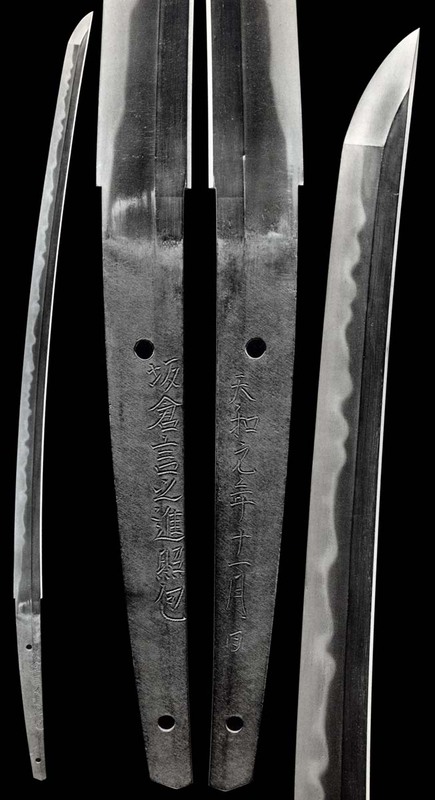 An exceptional Ko-Itame Ko-Mokume with running Masame in the Shinogi-ji. 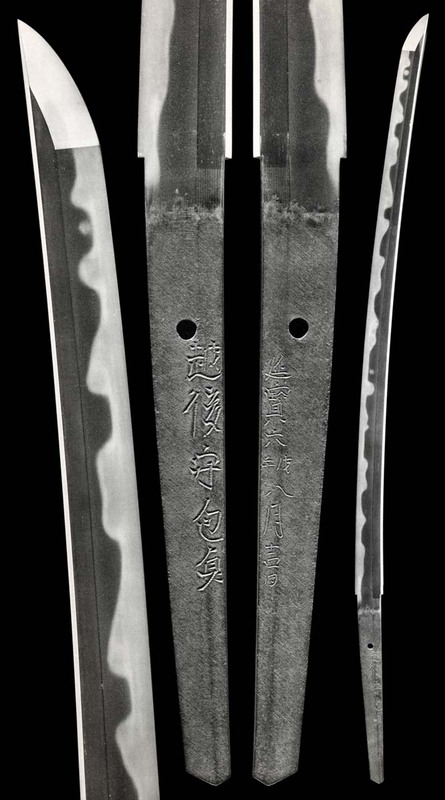 Ji-nie in wet steel. Gunome Choji are grouped into mounds with sweeping Sunagashi. Kinsuji cuts into tops. Ko-Nie is very finely defined. Boshi has Kinsuji and Inazumi arced Hakikake. Saagari Chu-Maru to short Kaeri.